The title of "King of Kings", often rendered imprecisely in English as "Emperor", dates back to ancient Mesopotamia, but was used in Axum by King Sembrouthes (c. 250 AD). However, Yuri Kobishchanov dates this usage to the period following the Persian victory over the Romans in 296–297. Its use, from at least the reign of Yekuno Amlak onward, meant that both subordinate officials and tributary rulers, notably the gubernatorial vassals of Gojjam (who ranked 12th in the states non-dynastic protocol as per 1690), Welega, the seaward provinces and later Shewa, received the honorific title of nəgus, a word for "king." The consort of the Emperor was referred to as the ətege. Empress Zauditu used the feminized form nəgəstä nägäst ("Queen of Kings") to show that she reigned in her own right, and did not use the title of ətege. At the death of a monarch any male or female blood relative of the Emperor could claim succession to the throne: sons, brothers, uncles or cousins. Practice favoured primogeniture but did not always enforce it. The system developed two approaches to controlling the succession: the first, employed on occasion before the 20th century, involved interning all of the Emperor's possible rivals in a secure location, which drastically limited their ability to disrupt the Empire with revolts or to dispute the succession of an heir apparent; the second, used with increasing frequency, involved the selection of Emperors by a council of the senior officials of the realm, both secular and religious. Ethiopian traditions do not all agree as to exactly when the custom started of imprisoning rivals to the throne on a Mountain of the Princes. One tradition credits this practice to the Zagwe king Yemrehana Krestos (fl. 11th century), who allegedly received the idea in a dream; Taddesse Tamrat discredits this tradition, arguing that the records of the Zagwe dynasty betray too many disputed successions for this to have been the case. Another tradition, recorded by historian Thomas Pakenham, states that this practice predates the Zagwe dynasty (which ruled from ca. 900 AD), and was first practiced on Debre Damo, which was captured by the 10th-century queen Gudit, who then isolated 200 princes there to death; however, Pakenham also notes that when questioned, the abbot of the monastery on Debre Damo knew of no such tale. Taddesse Tamrat argues that this practice began in the reign of Wedem Arad (1299–1314), following the struggle for succession that he believes lies behind the series of brief reigns of the sons of Yagbe'u Seyon (reigned 1285–1294). A constructivist approach[which?] states that the tradition was used on occasion, weakened or lapsed sometimes, and was sometimes revived to full effect after some unfortunate disputes – and that the custom started in time immemorial as Ethiopian common inheritance patterns allowed all agnates to also succeed to the lands of the monarchy – which however is contrary to keeping the country undivided. The potential royal rivals were incarcerated at Amba Geshen until Ahmed Gragn captured that site in 1540 and destroyed it; then, from the reign of Fasilides (1632–1667) until the mid-18th century, at Wehni. Rumors of these royal mountain residences were part of the inspiration for Samuel Johnson's short story, Rasselas. Although the Emperor of Ethiopia had theoretically unlimited power over his subjects, his councillors came to play an increasing role in governing Ethiopia, because many Emperors were succeeded either by a child, or one of the incarcerated princes, who could only successfully leave their prisons with help from the outside. As a result, by the mid-18th century the power of the Emperor had been largely transferred to his deputies, like Ras Mikael Sehul of Tigray (ca. 1691 – 1779), who held actual power in the Empire and elevated or deposed Emperors at will. The Emperors of Ethiopia derived their right to rule based on two dynastic claims: their descent from the kings of Axum, and their descent from Menelik I, the son of Solomon and Makeda, Queen of Sheba. The claim to their relationship to the Kings of Axum derives from Yakuno Amlak's claim that he was the descendant of Dil Na'od, through his father, although he defeated and killed the last Zagwe king in battle. His claim to the throne was also helped by his marriage to that king's daughter, even though Ethiopians commonly do not acknowledge claims from the distaff side. The claim of descent from Menelik I is based on the assertion that the kings of Axum were also the descendants of Menelik I; its definitive and best-known formulation is set forth in the Kebra Nagast. While the surviving records of these kings fail to shed light on their origins, this genealogical claim is first documented in the 10th century by an Arab historian. Interpretations of this claim vary widely. Some (including many inside Ethiopia) accept it as evident fact. At the other extreme, others (mostly interested non-Ethiopians) understand this as an expression of propaganda, attempting to connect the legitimacy of the state to the Ethiopian Orthodox Church. Some scholars take an approach in the middle, attempting to either find a connection between Axum and the South Arabian kingdom of Saba, or between Axum and the pre-exilic Kingdom of Judah. Due to lack of primary materials, it is not possible as of 2006[update] to determine which theory is the more plausible. The restored Solomonic dynasty, which claimed descent from the old Aksumite rulers, ruled Ethiopia from the 13th century until 1974, with only a couple of usurpers. The most significant usurper was Kassa of Kwara, who in 1855 took complete control over Ethiopia and was crowned Tewodros II (he developed a claim to have been descended from the Solomonics on the distaff side). 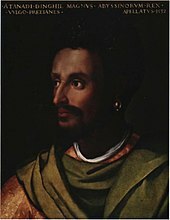 After his defeat and demise, another Solomonic dynasty, Dejazmatch Kassai took over as Yohannes IV; however, his distaff descent from Solomonics was a well-attested fact. Menelik of Shewa, who descended from Solomonic Emperors, in the direct male line (junior only to the Gondar line), ascended the imperial throne following Yohannis IV's death, thus purporting to restore the male-line Solomonic tradition. The most famous post-Theodorean Emperors were Yohannes IV, Menelik II and Haile Selassie. Emperor Menelik II achieved a major military victory against Italian invaders in March 1896 at the Battle of Adwa. Menelik lost Eritrea to Italy and Djubouti to France. After Menelik, all monarchs were of distaff descent from Solomonics. The male line, through the descendants of Menelik's cousin Dejazmatch Taye Gulilat, still existed, but had been pushed aside largely because of Menelik's personal distaste for this branch of his family. Menelik's Solomonic successors ruled the country until the military coup in 1974. In 1936, with the Italian conquest of Ethiopia, Emperor Haile Selassie was forced to flee abroad. Benito Mussolini soon declared Ethiopia, together with Italian Eritrea and Italian Somaliland, a colonial Empire called Italian East Africa ("Africa Orientale Italiana"). During the summer of 1936 Victor Emmanuel III of Italy proclaimed himself Emperor of Ethiopia, a title that was initially considered illegitimate by the international community, but in 1940 was recognized by most members of the League of Nations. In June 1940, even the US and USSR were starting the process of recognition of the title (only Mexico never recognized it), but World War II blocked all this. The title lasted almost five years, until 1941. Victor Emmanuel III later officially renounced the title at the end of 1943. Haile Selassie returned to power with the British conquest of the Italian East Africa during World War II. In January 1942 he was officially reinstated to power in Ethiopia by the British government. The position of the Emperor and the line of succession were strictly defined in both of the constitutions adopted during the reign of Haile Selassie: the one adopted on July 16, 1931; and the revised one of November 1955. Haile Selassie was the last Solomonic monarch to rule Ethiopia. He was deposed by the Derg, the committee of lower-ranking military and police officials on September 12, 1974. The Derg offered the throne to Haile Selassie's son Amha Selassie, who – understandably mistrustful of the Derg – refused to return to Ethiopia to rule. 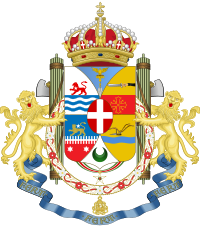 The Derg abolished the monarchy on 21 March 1975. In April 1989, Amha Selassie was proclaimed Emperor in exile at London, with his succession backdated to the date of Emperor Haile Selassie's death in August 1975 rather than his deposition in September 1974. In 1993 a group called the "Crown Council of Ethiopia", which included several descendants of Haile Selassie, affirmed Amha as Emperor and legal head of Ethiopia. However, the 1995 Constitution of Ethiopia confirmed the abolition of the monarchy. ^ "The Ark of the Covenant: The Ethiopian Tradition". Retrieved 2013-02-16. ^ Nathaniel T. Kenney, "Ethiopian Adventure", National Geographic, 127 (1965), p. 555. ^ Yuri M. Kobishchanov, Axum, translated by Lorraine T. Kapitanoff, and edited by Joseph W. Michels (University Park: University of Pennsylvania State Press, 1979), p. 195. ISBN 0-271-00531-9. ^ Francisco Álvares, The Prester John of the Indies, translated by Lord Stanley of Alderley, revised and edited with additional material by C.F. Beckingham and G.W.B. Huntingford, (Cambridge: The Hakluyt Society, 1961), p. 237ff. ^ Taddesse Tamrat, Church and State in Ethiopia (1270–1527) (Oxford: Clarendon Press, 1972), p. 275, n. 3. ISBN 0-19-821671-8. ^ Thomas Pakenham, The Mountains of Rasselas (New York: Reynal & Co., 1959), p. 84. ISBN 0-297-82369-8. ^ Zagwe Dynasty continued to rule in Lasta for centuries; restored to imperial throne in 1868. Buyers, Christopher. "The Solomonic Dynasty". The Royal Ark. Retrieved 2010-06-25. Buyers, Christopher. "The Tewodros Dynasty". The Royal Ark. Retrieved 2010-06-25. Buyers, Christopher. "The Tigray Dynasty". The Royal Ark. Retrieved 2010-06-25. Buyers, Christopher. "The Zagwe Dynasty". The Royal Ark. Retrieved 2010-06-25.